Skewed Preferences: From left to right: the wealth distribution Norton’s respondents said would be ideal; how they estimated wealth was currently distributed; and the actual distribution of wealth in the United States. 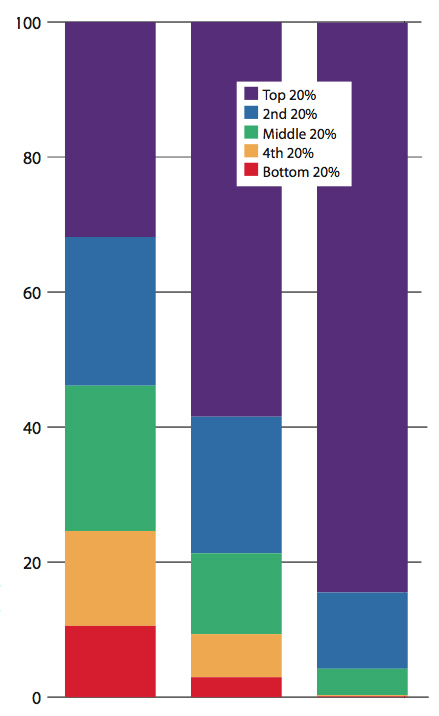 See poll results of Michael Norton's survey on wealth distribution. Americans have a distorted sense of the level of inequality in their society—but not in the direction one might expect. Associate professor of business Michael I. Norton has found that respondents to his surveys universally think that wealth is more evenly distributed in the United States than it actually is—and what’s more, respondents say they would prefer for the wealth to be still more evenly spread around. More than 80 percent of the wealth in the United States belongs to 20 percent of the population; respondents estimated that this group held less than 60 percent of the wealth, and would in an ideal world hold about a third. The lowest two quintiles (a group with average net worth of $2,200) control 0.2 percent and 0.1 percent of the wealth, respectively. But respondents estimated that these groups held 6 percent and 3 percent, respectively, and said they would like them hold about 15 percent and about 10 percent instead. Norton and his coauthor, Dan Ariely (author of the popular title Predictably Irrational and a professor of behavioral economics at Duke), believe that one reason perceptions are so skewed is because the easy availability of credit masks people’s real financial situation. If your neighbors own the same make and model of car that you own, Norton points out, there’s no way to know whether they paid cash for theirs or took out a loan for the full amount. It’s easy, he says, to think, “I have a car and you have a car, so I guess wealth is equally distributed.” This perception is reinforced by the fact that people tend to interact primarily within their own social stratum. What is surprising given these circumstances, says Norton, is that Americans at all income levels—the very rich as well as the very poor—said they would like wealth to be more evenly distributed. Although respondents who reported having voted for George W. Bush as president in 2004 chose slightly less wealth redistribution for their ideal world, their responses were still quite close to those of John Kerry voters—they chose a desired distribution far more equal than the actual distribution of wealth, and more equal than what they estimated the actual distribution to be. Norton notes that much depends on how one frames the question: if asked explicitly, “Do you support wealth redistribution to reduce inequality?” most of those Bush voters would probably have said no. This implies a separate observation: that people’s abstract preferences about inequality, expressed in a survey, may not lead them to vote in a way that brings policy into line with these preferences. People tend to assume, says Norton, that wealth correlates with talent or hard work—that it is deserved. Health inequality, on the other hand, is correlated with income inequality: on average, the poor are less healthy, and countries with higher income inequality perform less well on health measures (see “Unequal America,” July-August 2008, page 22). Norton thinks people may be more motivated to eliminate wealth inequality if they understand that it correlates with health inequality: “It’s hard to say that poor people’s babies should die more than rich people’s babies.” For his next study, he would like to investigate whether he can influence voting behavior by presenting respondents with accurate information about the actual distribution of wealth in society immediately after they take his survey.